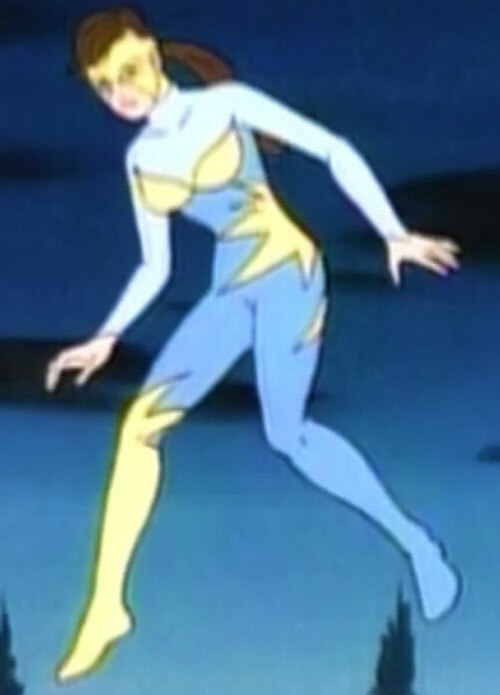 Lightwave is Iceman’s mutant sister on Earth-8107, the Spider-Man and His Amazing Friends cartoon world. For more context, you should first read our Iceman (Spider-Man and His Amazing Friends) character profile. Known Relatives: Bobby Drake aka Iceman (half-Brother), unnamed (Mother), unnamed (Father). Group Affiliation: None, formerly S.H.I.E.L.D.. Height: 5’7” Weight: 100 lbs. Lightwave has the ability to manipulate and control light in various ways. She can fire very accurate, concentrated, laser beams from her hands or forehead. She can also trap targets in solid photon force bubbles. Lightwave is adept at dodging attacks. Though small, she can smash through barriers by flying through them. 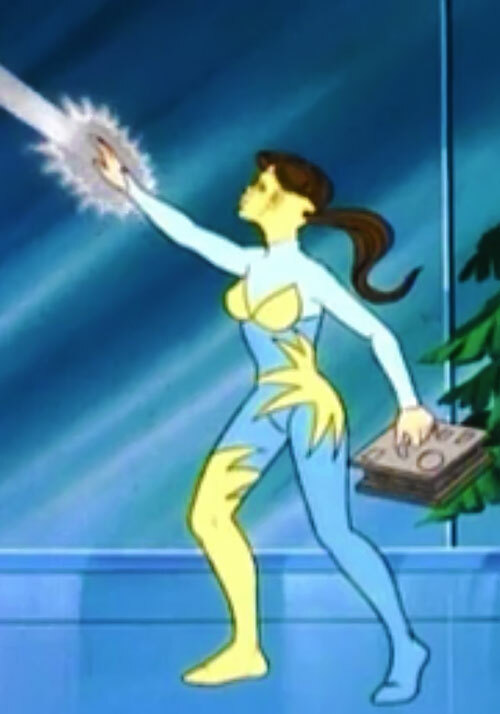 She can also manipulate technology with a touch of her light based energy. Transforming her body completely into energy, she can survive the vacuum of space. Lightwave is a mutant who was once a S.H.I.E.L.D. agent until she allegedly turned traitor. This was the background for Aurora given to Spider-Man and Firestar after they themselves were recruited by S.H.I.E.L.D.. In truth, Lightwave had been brain-washed by rogue S.H.I.E.L.D. agent Buzz Mason. Mason wanted control of a new satellite system called the Guardstar. The Guardstar, once in place, would control all of the nation’s defense and communication systems. In Mason’s mind, enough control to conquer the Earth! The brainwashed Lightwave had the ability to interface with this satellite and control the entire system. 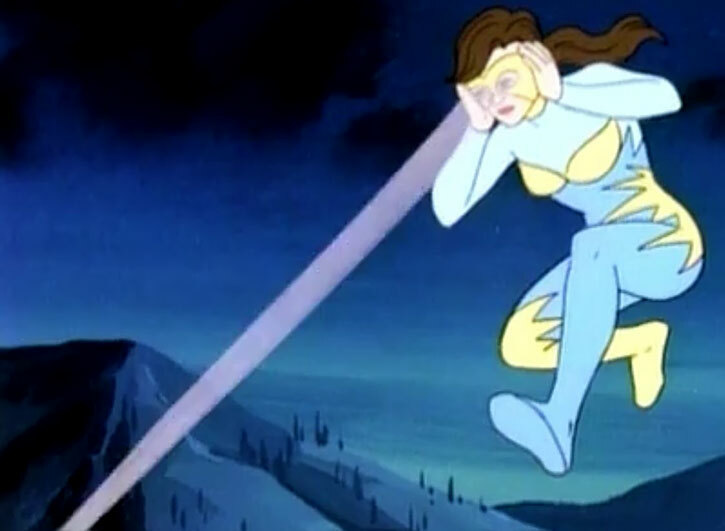 However, her power’s range proved to be too short. Under Agent Mason’s orders, Lightwave broke into military facilities and stole parts to build a quantum enhancer. This machine would amplify her power a thousand fold allowing her to control the Guardstar from Earth. 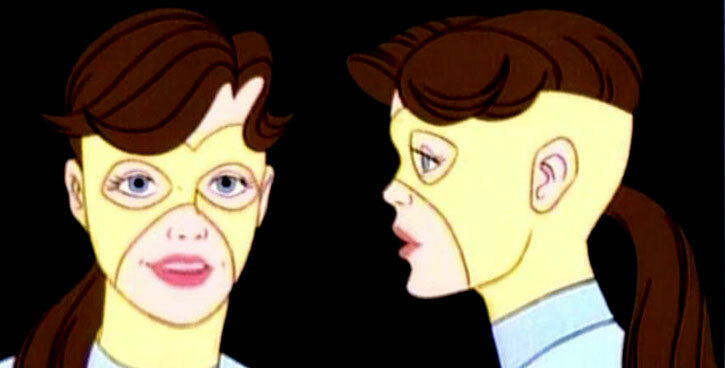 As a measure to keep track of Spider-Man and Firestar, Mason contacted the heroes and recruited them. He asked for their help in finding and defeating Lightwave. Iceman was Lightwave’s brother and so, when the Spider-friends got involved. He took it upon himself to find out what was going on with her. Pretending to also be brainwashed, Iceman learned how his sister was being controlled. Spider-Man and Firestar were knocked unconscious while attempting to stop the siblings from robbing a military convoy. They were taken back to Mason’s hidden base. Iceman revealed his duplicity when Agent Mason tried to brainwash his friends. The trio were unsuccessful in another attempt to defeat Mason and Lightwave. Mason had to flee without his enhancer. His quantum enhancer lost, Mason had to come up with a new plan. He and Lightwave took a ride on a NASA space shuttle. In space, Lightwave would be close enough to use her power on the Guardstar Satellite. She transformed into light, flew around the satellite. When she returned the Guardstar was in her control. Three Spidey-stow-aways arrived to ruin their celebration. 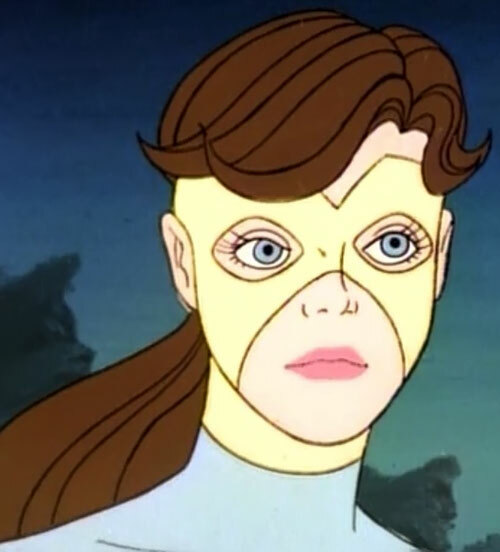 Firestar was useless in zero-gravity and quickly fell unconscious. 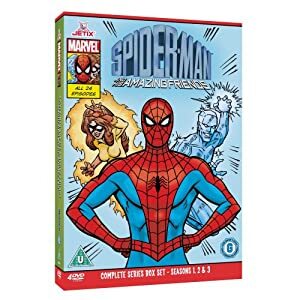 Spider-Man was pinned down by Lightwave and Mason launched Iceman into space! Spider-Man pleaded with Lightwave to save her brother. Lightwave though conflicted pushed through Mason’s mind-control! She found the courage to turn her power on agent Mason, brought him to justice and saved her brother. 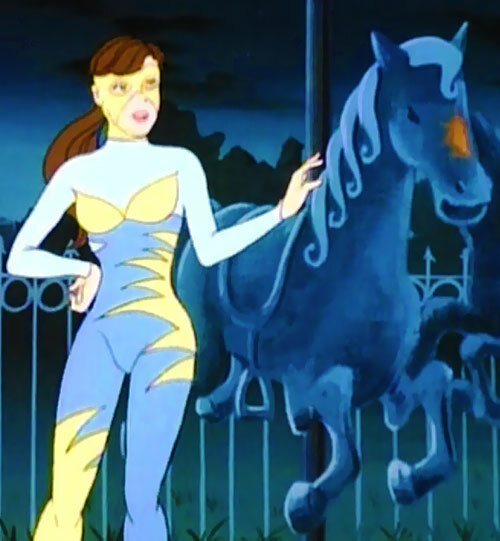 Lightwave is a young woman who wears a yellow and sky blue costume with yellow face mask. Her hair is worn back in a pony-tail. In her civilian life she wears her hair in the same style. Aurora is the younger sister to Bobby Drake, they share the same mother. When her mission takes her near an amusement park she can’t help but stop by a carousel just to visit her favorite horse “Whinney”. 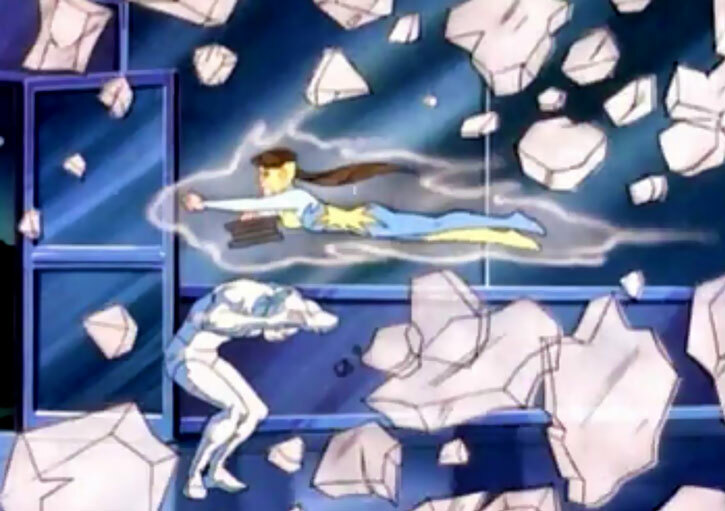 Aurora and Bobby have a typical sibling rival relationship. They often challenge each other. Even when at odds they have a deep love for one another. It was this love that allowed Aurora to break Mason’s mind control just when she needed to most. Energy Being may be used to perform ramming attacks with her flight (+0). Energy Blast is photon energy and may be used self-linked or not. Glue represents Lightwave’s ability to trap victims in a “photon force bubble”. Interface is contingent on Energy Blast (-1). 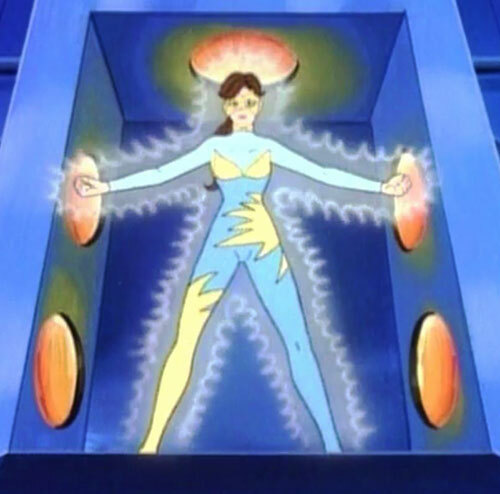 Interface has normal range through the Energy Blast power (+1), meaning her energy must touch the machine to be interfaced with. Sleep is contingent on either Force Field or Glue affecting those within. 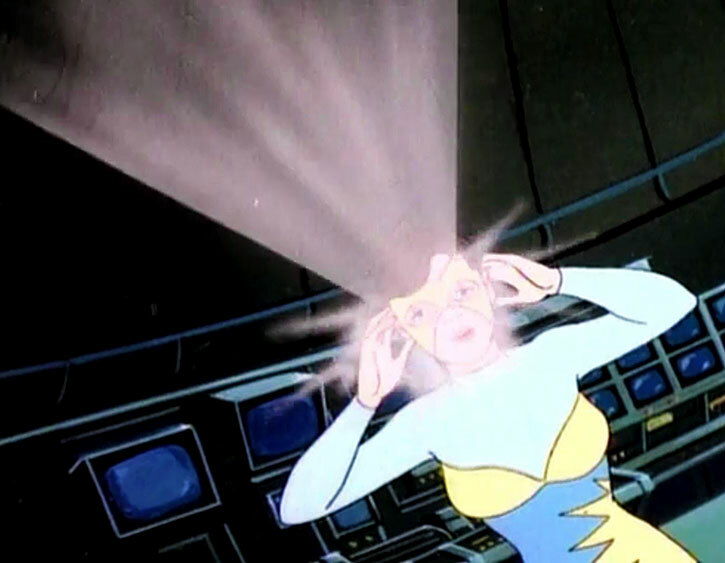 Telekinesis originates as a beam of light from Lightwave’s forehead. Thief is a Powered skill and contingent on Energy Being (BC+20, FC-1). 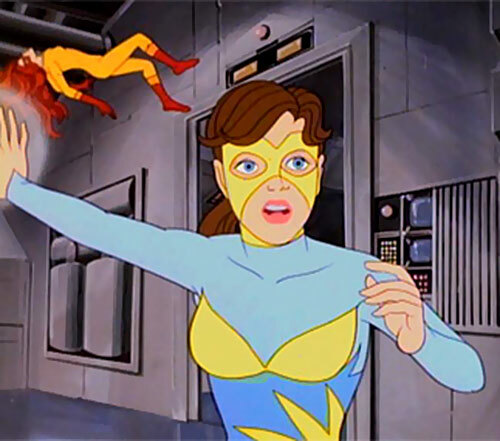 Source of Character: The 1981 animated series Spider-Man and his Amazing Friends, episode Mission: Save the Guardstar, voiced by Marlene Aragon. Helper(s): Wikipedia, Adam Fuqua, Darci, Mike Davis. Writeup completed on the 19th of February, 2013.